Transparency Market Research (TMR) has published a new report titled, “Coronary Artery Bypass Graft Market - Global Industry Analysis, Size, Share, Growth, Trends, and Forecast, 2018–2026”. 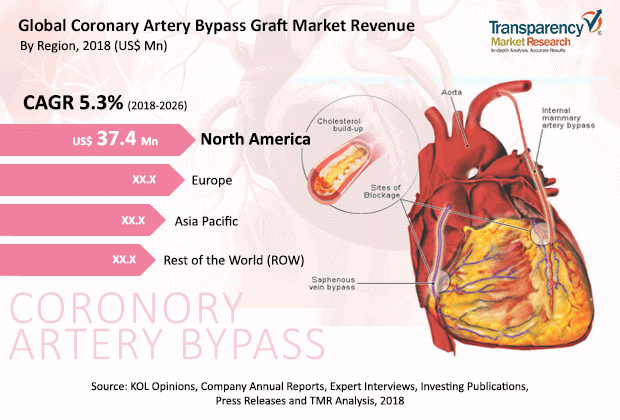 According to the report, the global coronary artery bypass graft market was valued at US$ 104.0 Mn in 2017 is projected to expand at a CAGR of 5.3% from 2018 to 2026. Increase in cardiovascular diseases, rise in awareness about endoscopic surgeries, surge in geriatric population, and technological advancements are the major factors anticipated to fuel the growth of the market from 2018 to 2026. Improved hospital infrastructure in the developed markets such a North America and Europe, rise in medical tourism in Asia Pacific, and advantages of endoscopic surgeries are expected to drive the market during the forecast period. Endoscopic surgeries offer advantages such as short hospital stay and minimal incision at the surgery site. Endoscopic surgery is used to diagnose or treat diseases. Advantages associated with endoscopic surgeries include minimal blood loss, no requirement of general anesthesia, outpatient surgical procedure, small incision, less bleeding, and quick discharge within 2 to 4 days. These factors have increased demand for endoscopic surgeries across the globe. Cardiovascular diseases is a leading cause of premature deaths among the geriatric population or even among the younger population. Globally, the number of deaths due to cardiovascular diseases has increased in the last decade. There was 41% increase in deaths due to cardiovascular diseases from 12.3 million in 1993 to 17.3 million 2013. According to European Heart Network statistics, CVD accounts for nearly 3.9 million deaths in Europe each year and around 1.8 million deaths in the European Union. Advantages of off-pump CABG such as reduced hospital stay, minimal blood loss, lower post-operative complications, and useful in treating multiple blocks are expected to fuel the growth of the segment. An article published on Medicine Net stated that the overall mortality rate for CABG is approximately 3% to 4%. Heart attack after CABG procedure is quite common in 5% to 10% cases and stroke in 1% to 2% of patients. Around 5% of the cases require exploration due to significant blood loss. In cases where second surgery is required, there are high chances of infection in chest and lungs. Increase in prices of CABG procedures in developed countries such as the U.S. and the U.K. is a key factor restraining the global coronary artery bypass graft market. The cost of CABG procedure in the U.S. ranges from US$ 70,000 to US$ 200,000 and it costs US$ 28,000 in the U.K., US$ 32,000 to US$ 42,130 in Australia, and US$ 16,247 to US$ 23,600 in Spain. In terms of revenue, the coronary artery bypass graft market in Asia Pacific is expected to expand at a CAGR of 5.9% during the forecast period. Rise in medical tourism in India due to low cost of surgery is projected to boost the growth of the market in the region. The cost of CABG surgery in India ranges from US$ 1,500 to US$ 5,400. According to Assocham (2015), India's medical tourism sector more than doubled between 2011 and 2015, i.e., US$ 980.0 Mn to US$ 1.8 Bn. Cost of medication and surgeries in developed countries in Asia Pacific is comparatively lower than in countries such as the U.K. and the U.S. Moreover, up-to-date treatment facilities, skilled doctors, and consultants will attract the western population to the region for extensive treatments. The report also provides profiles of leading players operating in the global coronary artery bypass graft market such as Medtronic, Terumo Corporation, KARL STORZ GmbH & Co. KG, Boston Scientific, Ethicon (a subsidiary of Johnson & Johnson), Neograft, Sorin Group, MAQUET Holding B.V. & Co. KG, Edwards Lifesciences, Vitalitec International, Inc., Novadaq Technologies, Inc., and Genesee Biomedical, Inc.